A stretch of the Friant-Kern Canal where the city hopes to build a new bike path. In this image, a rendering of bike path is shown between the canal and an orchard. An area where the canal passes beneath the Westside Parkway. A rendering shows the proposed bike path near the Westside Parkway. 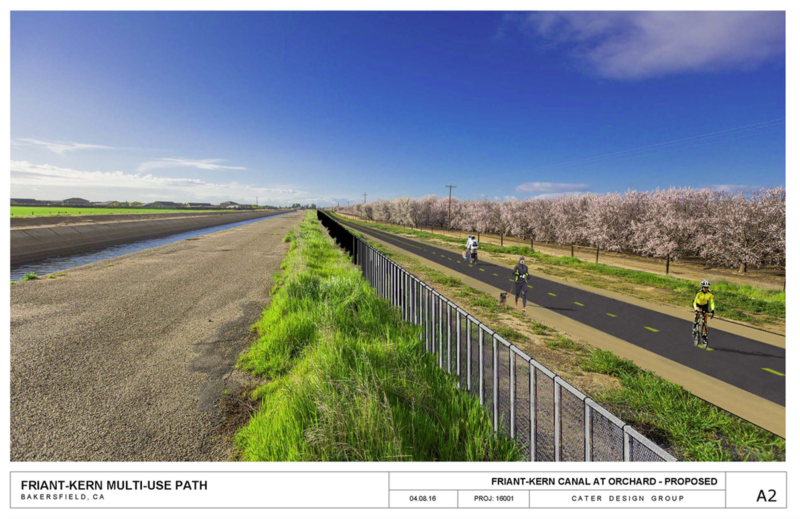 A new bike path along the Friant-Kern Canal could be in Bakersfield’s future. 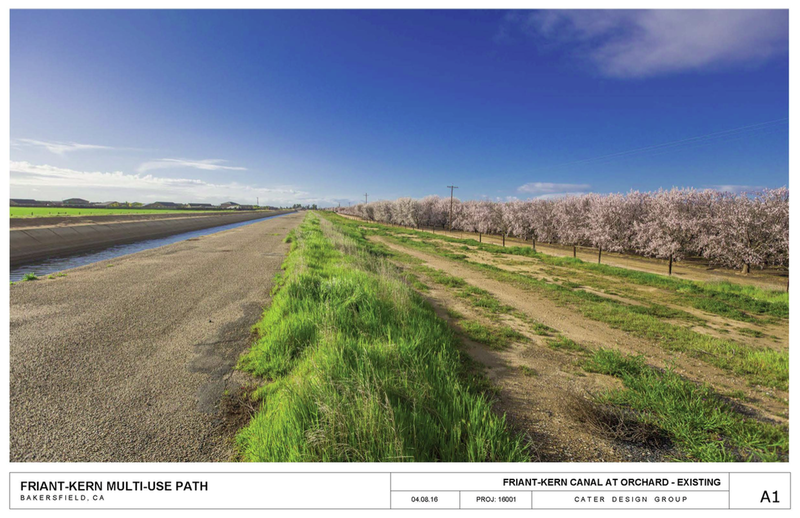 The City of Bakersfield recently applied for $11.6 million in state grants with the hopes of funding three projects with the money, including a six-mile bike route that would follow the Friant-Kern Canal, connecting 7th Standard Road to the Kern River Parkway. He said the County of Kern or the City of Shafter could choose to extend the bike path – if the project comes to fruition – to create a regional route for cyclists throughout the metropolitan area and beyond. The project would cost approximately $8.2 million. The funds would come from the state’s Active Transportation Program, which is meant to provide funds to projects that encourage modes of transportation that involve physical activity. City Councilman Bob Smith helped come up with the plan for the bike path in 2012. He hopes the bike path could help connect the north part of town to the rest of the city. The bike path would be separate from the street, running next to the canal with areas for biking and walking. Importantly, the path would connect to the 32-mile Kern River Parkway, which cuts across Bakersfield from east to west, and serves as an active transportation corridor. But without the grant funds, the project could go back on the shelf for the time being. “The city is always trying to do more with less and grants are a very creative way that we can get funding for projects we typically don’t have money for,” Gerry said. One of the two other projects the city requested grant money for would create a bicycle and pedestrian safety program for the Bakersfield metropolitan area. The other would enable the construction of around 65,568 feet of sidewalks in the area of W.A. Kendrick Elementary School, in southeast Bakersfield. In 2016, Bakersfield ranked 12th in the nation for most dangerous metro area for pedestrians according to Smart Growth America, a national organization that studies how metropolitan expansion impacts quality of life. “I think there’s definitely a need for more bicycle and pedestrian-related programs to educate the community,” Gerry said. If awarded the $2.1 million grant, the city would partner with the county to fund more law enforcement in areas with the highest amounts of pedestrian and bicycle collisions as well as fund outreach campaigns to local residents to better educate them on safety. The $1.3 million grant application for sidewalks near Kendrick Elementary would create sidewalks in that neighborhood for the first time. The city will be competing against all municipalities in California that apply for the Active Transportation Program grants. In this cycle, the state made available $440 million in grant awards. “I think it’s highly probable that we will get two out of three grants, if not all three grants,” Gerry said. But part of the funding for the program comes from the recently increased state gas tax. If the tax is repealed in November, the projects could be impacted, although Gerry did not know to what extent. A statewide ballot initiative has qualified to appear on the November ballot. If a majority of voters vote to repeal it, the 12-cents per gallon tax increase could go away, along with a significant portion of the funding for the state grants. The Los Angeles Times has reported that polls indicate a majority of Californians want to repeal the tax. For the moment, the most the city can do is wait for the awards to be handed out, and hope for the best. The grant will be awarded in December. Although this would be a wonderful project, shouldn't the gas tax funds be prioritized for improvements to existing roadways? As a taxpayer/fuel purchaser/voter, I was under the impression that's how the funds would be used. Using funds like this will, most likely, empower voters to VOTE YES ON PROP 6. Getting more bikes off of major thoroughfare roads makes the roadways safer for both motorists and cyclists. Sure, it's not repairing potholes or anything but it is certainly improving the flow of traffic on major streets. Good article. Seeing it on a map would be cool. This would be great if it happens, but why not in other areas of the city too? Unfortunately the city rejected the Strategic Growth Council's proposal that the City apply for $30M to invest in disadvantaged communities close to downtown. This could have been used to fund the extension of Mill Creek Park into some of our city's most historic neighborhoods. If a bike path is good for NW Bakersfield, it certainly is good for SE.